Over SIX MILLION Visits in 12 months! Bucking industry trends, J2Ski.com again served more skiers and snowboarders than the previous season. Due to the high quality, organic, nature of our traffic we have been able to maintain solid visitor numbers for a decade. In the five months from November 2016 through March 2017, J2Ski.com served 5.3 Million Visitor Sessions (Visits) from 2.5 Million unique Users. 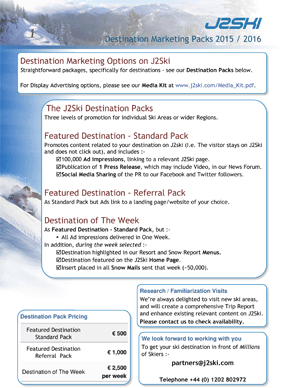 In the peak months of December, January AND February J2Ski.com served more than 1,000,000 - One Million visits each month. At peak season, one half of our daily traffic was repeat visits (according to Google Analytics). 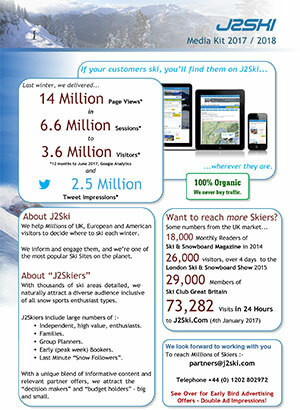 During the Ski Season, according to Alexa, J2Ski.com was consistently one of the Top 40,000 of all websites, worldwide, in terms of traffic.